Vessels arriving at Panama Canal waters, must comply with the visibility requirements from the conning positions on the Bridge deck, in order to be granted safe passage through the canal and ensure the navigational safety of the vessel. Non-compliance with Panama Canal rules and regulations may subject vessels to unnecessary delays or denial of transit or even the imposition of fines. Non-compliant vessels will need to take further risk control measures such as additional pilots or tugs (decided on a case by case basis by the ACP). If the vessel is laden, the view of the water surface from any conning position in the navigation bridge shall not be obscured by more than one (1) ship length forward of the bow, under all conditions of draft and trim. If the vessel is in ballast (not laden), the view of the water surface from any conning position in the navigation bridge shall not be obscured by more than one and one-half (1.5) ship lengths forward of the bow, under all conditions of draft and trim. If the visibility from normal conning positions is obscured by cargo gear or other permanent obstructions forward of the beam, the total arc of obstructed visibility from Conning Position 1 shall not exceed 15 degrees. The side hull plating at the vessel’s waterline, fore and aft, shall be visible from bridge wing conning positions. Vessels shall be required to execute an Undertaking and Release form if visibility from the bridge is considered by the Canal Authority to present a hazard. That means releasing the Panama Canal from being responsible for any loss or damage (damage to property/employees of ACP) caused by vessels navigation. At the same time by signing this form the Company is liable to indemnify the Panama Canal for any damages etc. should be 213.36 m or more in length. should not be equipped with centerline cranes or cargo gear, which in any way obstruct forward visibility. the view of the water surface from conning position No.1, as indicated in Figure 2 below shall not be obscured by more than two (2) ship lengths, or 500 meters, whichever is less, forward of the bow to 10° on either side, under all conditions of draft, trim and deck cargo. must have installed, prior to transit, pilot shelter platforms as required in Article 64 of the “Maritime Regulations for the Operations of the Panama Canal”. must be equipped with an operational bow thruster, otherwise it may, at pilot request, be assigned and charged for an additional tug through the Culebra Cut (an artificial valley that cuts through the continental divide in Panama). Notes: 1. On vessels without centerline cranes or any other centerline obstructions, visibility shall be measured along the centerline over the stem. Note 2. 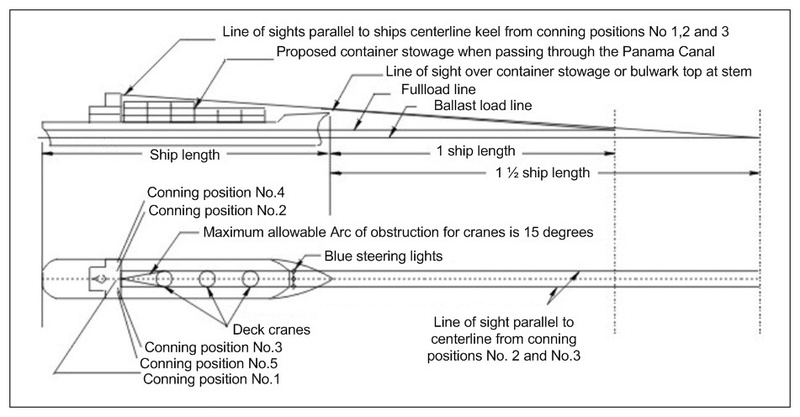 On vessels with centerline cranes or any other centerline obstruction visbility should be measured along lines which are parallel to vessel’s centerline keel from conning positions No.2 & No.3 over vessel’s bow. Note 3. Conning positions No.2 & No.3 are to be at those windows in the wheelhouse which are the nearest windows to the centerline which will provide a clear unobstructed view ahead along lines which are parallel to vessel’s centerline. For vessels over 150 feet LOA a report regarding their blind distance (in ship lengths), calculated for Tropical Salt Water, from conning positions 1, 2, and 3 is required. “Blind Distance” is the forward distance from the bow of the vessel to the closest point on the water’s surface which can be seen from all conning positions in the navigation bridge. Vessels intending to dock prior to transit must provide the visibility condition for docking and for transit. Vessels intending to dock only (local calls), must also provide the undocking visibility condition. In case where the visibility requirements have been changed, messages of the “Exceed ACP Visibility” status of the vessel are only allowed if they are made within the abovementioned 48 hours window prior to arrival. pay $ 4 ,000.00 when bridge visibility requirements are exceeded but the ACP has been notified at least 48 hours prior to the vessels arrival. In case the vessel’s transit is interrupted for reasons that are the vessel’s responsibility, i.e. mechanical failure, then the rate will be charged again if additional pilot assignments are required. pay $ 8 ,000.00 when bridge visibility requirements are exceeded but the ACP has been notified less than 48 hours prior to the vessels arrival. If the ACP has not been notified at all the same fine is applied. 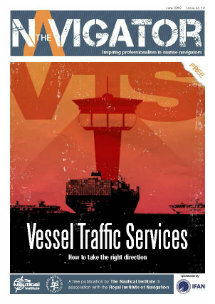 If the vessel’s transit is interrupted for reasons that are the vessel’s responsibility, i.e. mechanical failure, then the rate will be charged again if additional pilot assignments are required. Furthermore, in this case the vessel may be charged with other applicable charges as well.